Glass Wizard is the easiest way to clean glass ever invented! The large MicroFiber head will cut your cleaning time in half, while the comfort-grip handle gives you the extra reach you need. Glass Wizard lets you easily reach those tough corners. Glass Wizard is so powerful it cleans with just water! There’s no need for harsh or expensive chemicals. It’s great for windows, mirrors, windshields, sliding doors, tabletops, tile and more. 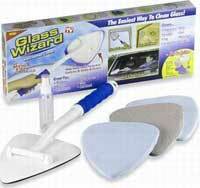 Glass Wizard easily cleans fingerprints, smudges, smears, smoke film, dust and water spots. You also get a “Grime Buster” bonnet that easily removes bugs, bird droppings and grime from your car’s windshield. Once you experience the cleaning power, ease and versatility of Glass Wizard, you’ll never go back to chemical sprays and paper towels again.